$19.95 In stock. Order in the next 1 hour, 33 minutes and it will go out today! Kids love magic. They love to see it and they love to do it. Vanishing Inc. co-founder Joshua Jay started doing magic when he was 7 and was named champion at the World Magic Seminar (the Olympics of Magic) by the time he was 16. 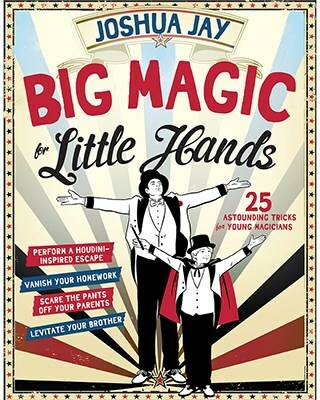 His Big Magic for Little Hands is packed with 25 astonishing illusions for kids ages 7 and up. In other words, it's sleight of hand for the small of hand. These are tricks that require little prep time and dexterity yet are guaranteed to deliver a big payoff. The large format, oversize text, and black-and-white vintage-style illustrations make Big Magic kid-friendly and particularly easy to follow. Kids will learn how to levitate their sibling several feet off a bed or escape, Houdini-like, from tightly bound ropes. There are also impromptu effects that can be performed anytime, anywhere, like Spook-Key, in which an antique key mysteriously rotates in your hand. Each easy-to-perform feat is clearly illustrated with step-by-step drawings and accompanied by insider tips. Joshua Jay is a master who guides his apprentices through every aspect of the magician's art, from the first step - taking the Magician's Oath - to how to minimize nervousness (Rule #1: Rehearse. A lot). The book is fully illustrated in black, red and white and has 100 pages. It is oversized at a giant 11" x 14". Though it's expensive to ship internationally, the really big size is what makes it so appealing to youngsters as they learn Big Magic for Little Hands.